﻿﻿﻿﻿The wonders of watching a screech-owl family in an urban backyard. On May 23, 2014, the baby-blue sky deepened into night. From my stepladder perch, I quickly lost sight of the two eastern screech-owl nestlings peering wide-eyed into the darkness above me. Since early March, from the privacy of my South Austin backyard, I’d been monitoring activity in what proved to be the perfect screech-owl home: the 30-foot-high hollow of a paper mulberry tree. I dreaded the coming moment of departure. The nestlings hatched and raised in the natural cavity were growing restless and bold. When the babies saw me climbing the ladder to take their picture, they no longer disappeared into the depths of the hole or hid beneath their mother’s wings. Now when the nestlings saw me, they practically posed, cocking their heads and staring straight at the camera lens as though reading my mind: “Please, please, look my way.” I knew the nestlings would soon leave the safety of their tree-cavity nursery, if not this night, then the next. I had fallen in love with these two babies, whom I’d named Puck and George. I wasn’t ready for them to go. Suburban screech-owls thrive across much of Texas. According to Cliff Shackelford, statewide nongame ornithologist for the Texas Parks and Wildlife Department, urban areas likely host more screech-owls than rural areas because of maturing shade trees and an abundance of favorite foods, such as mice and wood roaches. But it’s a complex situation, Shackelford explains, compounded by what’s called a “sink” population: Urban screech-owls might appear to be successfully reproducing, he says, but a high mortality rate sparked by domestic cat attacks, collisions with vehicles and other factors can keep the owls’ population numbers level or on the decline. Dependable screech-owl homes, such as wooden boxes that resemble natural cavities, can mitigate a sink population. So why don’t more beautiful urban trees provide suitable screech-owl habitat? The answer lies in the question: In the interest of beauty and safety, urbanites often trim damaged limbs or decaying natural cavities. Some people cut down entire trees to suit their aesthetic sensibilities, says eastern screech-owl authority Fred Gehlbach, professor emeritus of biology at Baylor University, where he taught from 1963 to 1995 and remained on faculty as a graduate student adviser until 2014. “People don’t realize they’re removing habitat for native species,” says Gehlbach, noting that other wild animals, such as squirrels, use natural cavities when they’re not occupied by screech owls. All of which brings me to my paper mulberry tree, which technically isn’t “my” tree. It stands in a neighbor’s backyard, rooted right up against our separating chain-link fence. The red-tip photinia shrubs on my side of the fence are so tall and thick that they hide the bottom third of the tree from view. High above the fence, the tree is in no-man’s land. The natural cavity that developed up there would be considered ugly by urban aesthetic standards. It’s a rotted-out scar on an old, broken limb facing and leaning toward my yard. But pretty is as pretty does. For the past several years at my home, a gray-phase eastern screech-owl — in my household, we like to believe that it’s always the same owl and his name is Oscar-Rufus — has arrived at winter’s end for a short stay in the hollow. Time and again, in fading evening light, I have watched the owl perch on the cavity’s edge, waiting for the magical summons of dusk. It’s a wild, beautiful sight. And in 2014, things got even wilder. Early in the year, the owl was a no-show. And then, on a gray and gloomy March 2, I just happened to look up. There sat an eastern screech-owl. I told myself not to get too excited. The owls always leave, after all. But by month’s end, this owl was still there. Slowly, it dawned on me: Maybe a female owl was incubating the eggs she had laid. And it seemed as if two adult screech-owls were using the cavity, with one staying put and the other coming and going at twilight. The owl occupying the cavity wore a medieval expression that made me shiver. In broad daylight, with talons gripping the cavity’s edge tight, the owl would slowly turn its head, scanning the yard for threats. I just knew there were baby screech-owls up there. 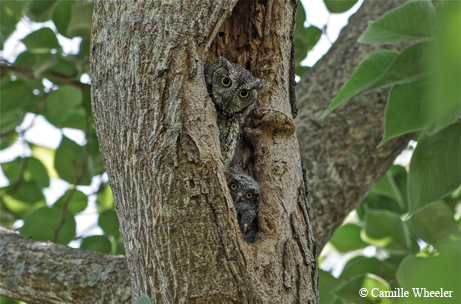 Finally, on May 18, with binoculars trained on the hollow, I saw the fuzzy gray heads of two screech-owl nestlings, their yellow, saucer-plate eyes profoundly wide open as if taking in a scary movie. On May 23, the nestlings swayed to and fro on the cavity’s edge in the gathering darkness. The babies were alone in the hollow, with their parents watching from adjacent trees in my backyard. One adult flew to the pecan tree in my front yard, as though asking the nestlings to follow. The other adult swooped into the cavity in a chaotic flapping of wings. Clearly, some sort of baby screech-owl operation was in the works. Mom and Dad were trying to coax the nestlings out of the nursery. Tears filled my eyes. I feared that the babies’ wings weren’t strong enough, that their minds weren’t wrapped around the task at hand. The next morning, the babies were still in the cavity. At dusk, the gray sky spat rain. Shortly before 9 p.m., I gasped: One of the babies, wings wildly flapping, was crawling out of the hole. And then the baby was out, clinging to the cavity’s edge for a terrifying split-second before clumsily hopping up onto a flimsy limb. It was now too dark to see. I couldn’t tell if the other nestling followed its sibling out of the cavity. Were the babies safe? Would they make it through the night? The next morning, the hollow was empty. I didn’t know if I’d ever see the babies again. But that evening, an angry mockingbird was harassing an adult screech-owl in the pecan tree. Surely the youngsters were nearby. As darkness fell, I spotted a fledgling high in the canopy, crawling on a branch and bobbing its head for visual orientation. The baby looked scared, but a parent was a few feet away. For the next hour, I lay beneath the tree, listening to the soft whinnying calls of the parent as it hunted and brought food to the quivering fledgling. I tried not to think about the other baby screech-owl. Anything could have happened. But at dusk on May 28, I saw both siblings snuggled together on a limb in a next-door neighbor’s tree. I laughed as the fledglings walked upright on spindly little legs, wobbling to regain their balance as if on a tightrope. I last saw the family of four in mid-June. Would I ever see the owls again? This year, on Jan. 17, I just happened to look up. There, in the hollow, sat an eastern screech-owl. It might just be one of my owls, said Gehlbach, whose research from 1967 to 2007 provided the first exhaustive case studies of the eastern screech-owl in the United States. As he explains, adult male screech-owls typically return to the same winter roosts. And the same screech-owl parents will return to a cavity where they successfully raised nestlings. The theme of my story, Gehlbach says, is the integration of native wildlife and cultural city life. Screech-owls can raise youngsters in urban habitats — including my backyard. On a Sunday afternoon in mid-January, I raked leaves in the backyard, glancing up at the cavity where the newly arrived screech-owl dozed in the sun. Would the owl stay? I didn’t know. But in this moment, everything felt right in my own private wilderness.